Craft Fail. I found something that CAN’T be spray painted. I have previously stated that you can spray paint anything that will hold still long enough. First of all, if you do try to spray paint feathers, they actually don’t hold still long enough. You have to spray in short bursts directly down onto them in order to keep them from blowing away. 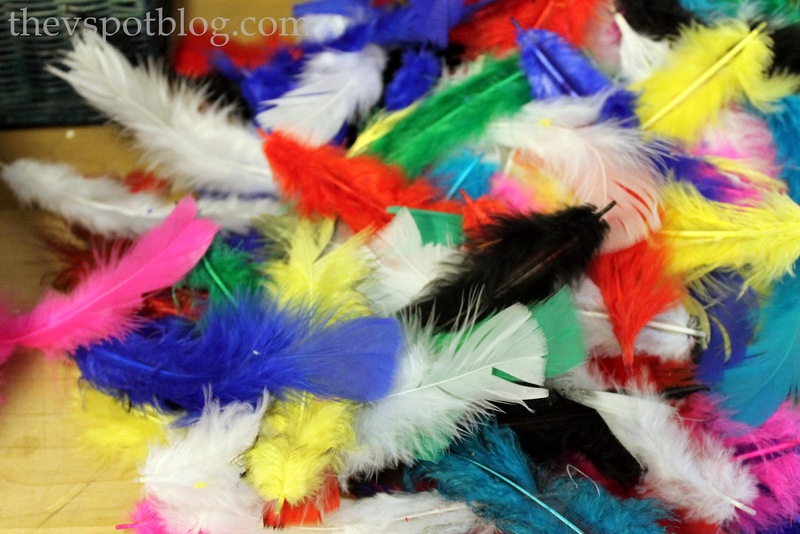 I was given this big bag of multi-colored feathers that I had no use for. However, with Fall and Halloween almost here (!!) my mind is going a thousand miles a minute. (I am even waking up at night with ideas. Does that happen to anyone else? Please say yes.) Anyhow, I saw no reason to buy black feathers when I was pretty sure I could just paint these. 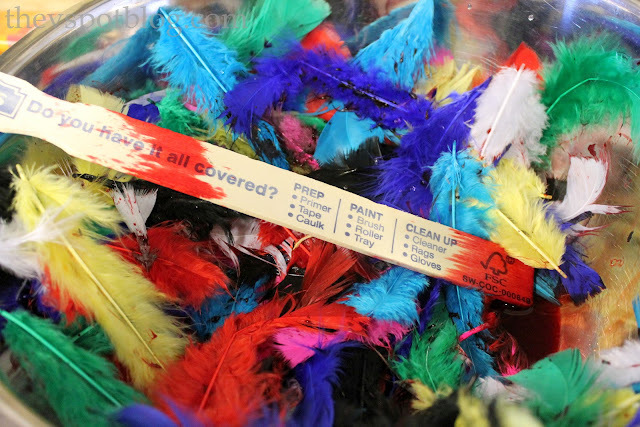 In addition to the blowing around issues, these feathers are some sort of synthetic material. Do you know what happens when you spray paint them? The “feathers” melt and stick together. Oil-Spill Covered Bird were not the feathered look I was going for. OK. Plan B: Tie Dye. I had such a great experience with the color and coverage of the Tulip Tie Dyes when I used them to dye this basket, that I thought they would be great for the feathers. I figured I would just soak them in the dye. Synthetic fibers. Apparently they actually repel the dye. I had been planning to mix several dye colors together to get the dark, blackish color I wanted. Once I saw the red dye just beading up on the feathers, I gave up. In fact, the only thing that picked up any color on the project were my fingers when my gloves tore. Plan C was going to be watering down black acrylic paint and trying to paint them that way. I’ve decided it would be less frustrating and expensive to just go buy the stupid black feathers. Oh man, I was all up for the challenge, but then you said acrylic…. Booooooo acrylic! I too agree that anything can be sprayed. Heck I just painted a tape dispensor! Thank you for sharing your fails as well as your successes! It’s good to know what things not to bother with, or what happens when you DO try it. I hate to say I’m happy to see this post, but I had been thinking the same thing. 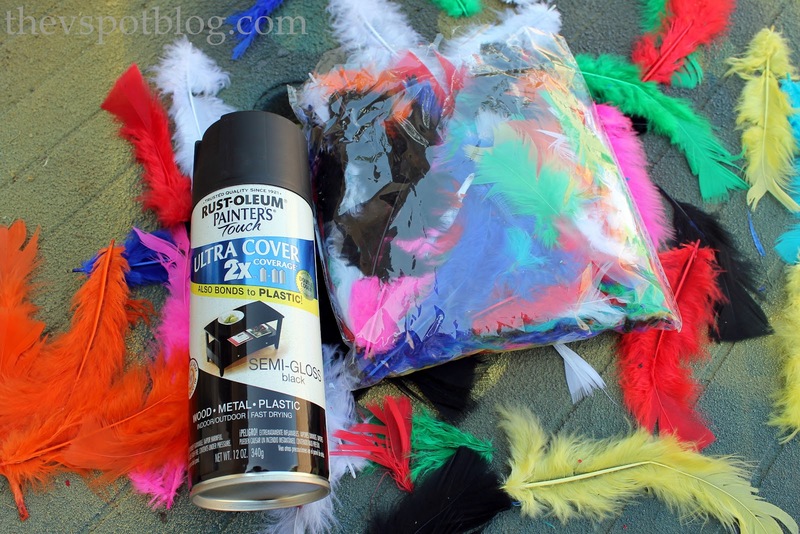 I to have a bag of the multi colored feathers and was thinking to spray them, I even spray painted my master bathrooms sink faucet several months ago (no problems so far). Also, about waking up in the middle of the night with ideas. That is how I started my site last week. Woohoo! I love craft fails. I LIVE craft fails. I know for a fact they can be spray painted…… you just have to attached them to a fake bird first! What? You mean you didn’t want to hand paint each one? 🙂 who knew you couldn’t paint feathers! Can’t wait to see what you do with the new black ones! I hope I wasn’t the only one chuckling happily for knowing that tip but sorry for your frustrations. It’s always good to share good tips don’t you think? Yes I do wake up and think of things I want to do. That’s now why I have to take sleeping pills so I can sleep. I used to get up to go to the bathroom but then couldn’t get back to sleep for “thinking”. Not too bad when I can sleep whenever but when I was working not so good. Thx so much for sharing. I do wake up at night when I am overload with ideas. I keep thinking to stick a notebook on my nightstand, but husband may not like light going on in the middle of the night so I can jot down my latest brilliant idea. Mostly I can’t fall asleep in the first place, and have to lay on the couch, write it all down, then stare at a book until the ideas decide the meeting is closed and leave until at least 5:00 a.m. for the next day. Craft fail? You???? Thanks for the warning on spray painting feathers. Can’t say I have tried this one.